Understanding the functionality of grids (lists) within Method. Grids (also known as lists) are used to display, sort, and filter information. 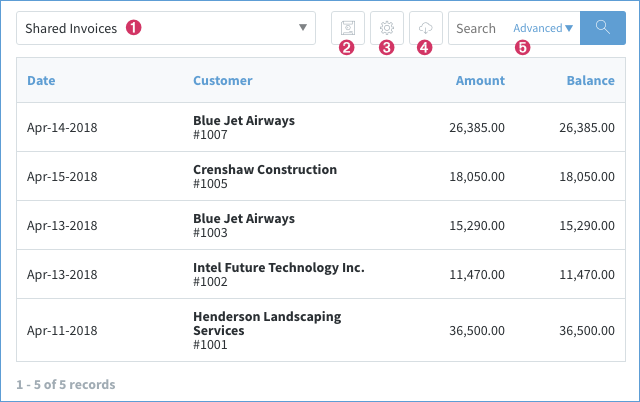 Most apps have a list screen – for example, the Invoice List shows you a rundown of all invoices currently saved in your Invoice table. It can be filtered to show, for example, only your outstanding invoices. Lists work the same way in every app, so let’s take a look at a sample: the invoice list! There are a number of elements of this screen that are standardized across all Method lists. Filter Views - Restrict what is shown in the grid. Custom Filter Views - For detailed information on this, see our article Custom Filter Views. Set Visible Columns - Choose what columns are shown on the grid. 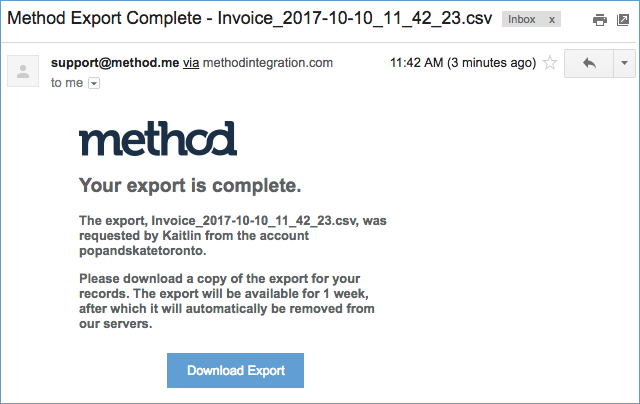 Export Options - Export data in grid. 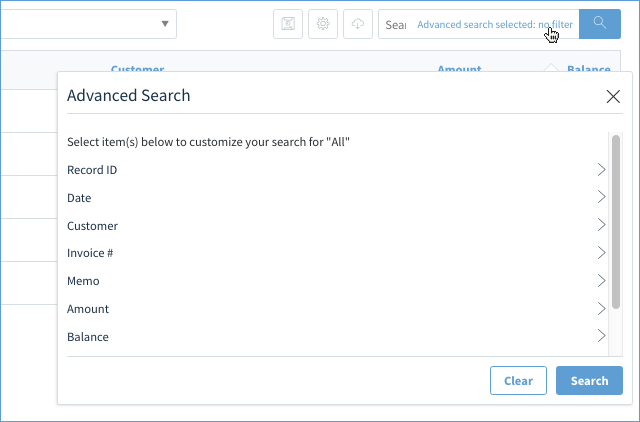 Search - basic and advanced available. On the upper left of a grid is the filter dropdown (If there is only one filter, then this dropdown will probably not show). This is an example of what the filter dropdown looks like on the List Invoices screen. This dropdown lets you restrict what shows in your list list based on certain criteria (called filter views). Method displays only the records in the table that meet this criteria. 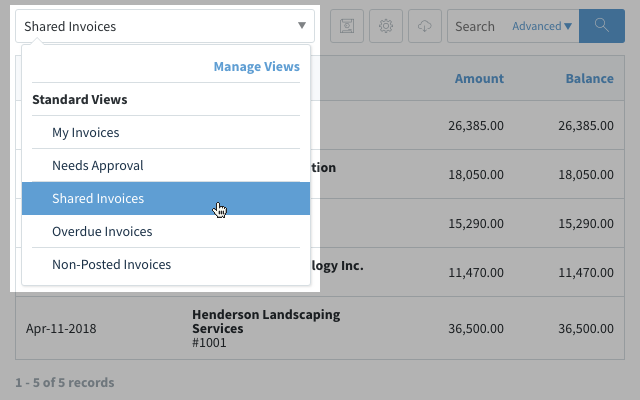 The available filter views change from app to app (for example, the “overdue invoices” filter view is unique to the Invoice App) but the two most common views are grouped into two types: “my” and “shared”. To learn how to assign shared permissions to users, see Account Permissions under Editing user settings. Although not pictured, also available are Custom Filter Views: views you can personalize for yourself. Please review our article on Custom Filter Views for more information on how to use them. The gear icon allows you to determine what columns are visible on your list. This will vary from app to app, depending on what columns have been configured for the grid. 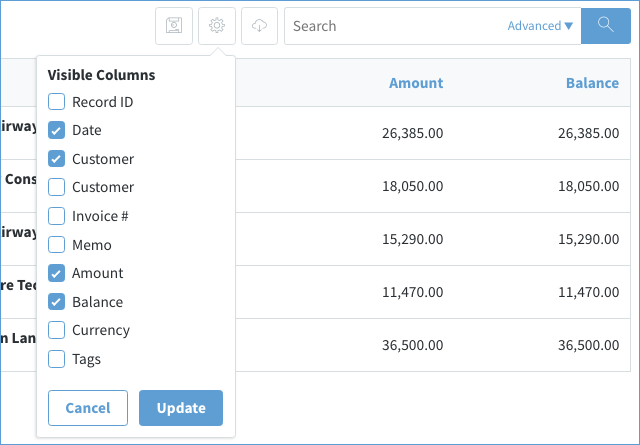 For example, in the invoice list, by default the columns displayed are Date, Customer, Memo, Balance, Currency, and Tags. 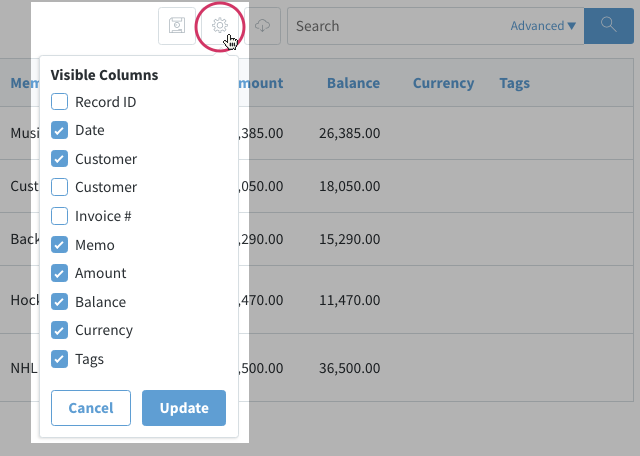 The columns Record ID, Customer, and Invoice # are hidden. You can temporarily add and remove columns by checking and unchecking these columns. Any column visibility changes you make to your list will only affect this Method session. If you refresh your browser or sign out and sign back in, all list displays revert to their default settings. You can make your changes again, or you can use Custom Filter Views to keep your changes. Every list has has a search bar offering two options: a basic search for one keyword and an advanced search that allows for more complicated filtering. All searches are restricted to what is displayed as a result of the chosen filter view. In other words, if you change the filter view to Overdue Invoices, and then you do a search, your search will not include invoices not overdue. However, all searches will search through all the columns attached to the grid, regardless if they are visible or not. To see a list of columns attached to the grid, click the Gear (as explained above). In the below example, there are ten columns in the grid. Four are visible (Date, Customer, Amount, and Balance) and the other six are not. If you were to search for an tag, the Tags column will still be searched through, even though it's not set to visible. 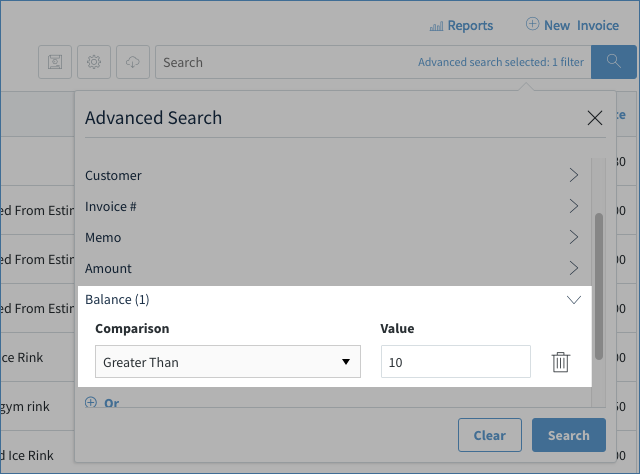 This conditional statement tells Method to search for all invoices whose balance is greater than $10. You can create multiple conditional statements for the same search, and you can clear all conditionals (clicking the clear button) and start over. Note: Searches and any advanced criteria you set up are not retained outside of your log in session. If you refresh your browser or sign out and sign back into Method, your search is gone. Using Custom Filter Views will allow you to keep your changes. Each grid offers an option to export data to a .csv file you can open in Excel. When enabled, this will appear beside the gear. Note: If you are viewing the Contacts list, you may also see an option to upload to Mailchimp. The advantage of exporting from a grid is your ability to filter and search the grid first before export. There is a limit to the number of records you can export, however. You cannot export past 15,000 records. 1. Navigate to the screen with the grid. 2. Using the View Filters, apply the desired filter to show only the data intended for export, if applicable. 3. Using the search, search through the grid to find only the data intended for export, if applicable. 4. Select the headers to choose how you wish to sort the data. Note: If you don't see this option you may need to enable it via customization. The highlighted number denotes what page you’re on. By default, Method displays ten records per “page” on this screen, so if you have more than ten records in a list, you will have more than one “page”. The arrow buttons allow you to navigate through the list. When a grid first loads, it will not show you the total number of records. Instead, it will have a clickable link called "many". Clicking this link will show you the number of records are in the grid. Grids can be customized to have a checkbox column. An example of this can be seen in the Email Campaigns app. The checkbox column allows you to select different rows within the grid. The Select All checkbox, the checkbox in the column header, has a number of different options to facilitate selection. Clicking the Select All checkbox will only check the rows that are visible in the grid. Any rows not shown on the grid, i.e. rows on other pages, will not be selected. In the above example, there are a total of 11 records with five shown on this page of the grid. Clicking Select All only selects the five records shown on this page. The other six records are not selected. You will be informed of this partial selection above the grid. As you can see from the above example, a yellow box appears telling you how many records have been selected. You are then given a link to "Select all records". Selecting the "Select all records" link will select every record in the grid, and the yellow information box disappears. By the way, the inverse of the Select All checkbox is also true. If all the records are selected and you uncheck the Select All checkbox, ONLY the rows visible on the page will be unselected. All other rows on other pages will still be selected. There is a small dropdown arrow (▾) beside the Select All checkbox that gives you more options. Select all on page - Only select records visible on current page of the grid. Select all records - Select all records in the grid. Unselect on page - Unselect records visible on current page of the grid. Clear all selections - Unselects every records in the grid. One final thing, when you select a subset of records in the grid, you will see a few more options that appear at the bottom of the grid near the page numbers. In the above example, when you select one or more records, the link All Selected Records appears. Selecting this link will change the grid to only display the selected records. This will help you verify if you choose the correct records. When viewing only selected records, the link at the bottom changes to View All Records. 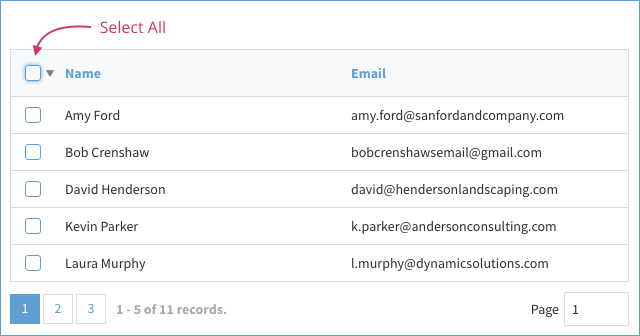 This will revert the grid back to its original state where all records are shown regardless of checkbox selection state. Note: If, at any time, you choose to Select all Records, then the option to view All Selected Records becomes DISABLED. To re-enable it, select Clear All Selections from the dropdown (▾).